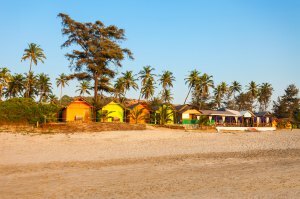 Located in India in the north of the state of Goa, Calangute has a population of just under 16,000 and is often highlighted on tourist brochures thanks to its paradise beach. There are many traces of the Portuguese occupation and the local culture mixes languages, religions and customs, while the tourism is very developed, offering the traveler hotels, restaurants, banks and various shops for a stay in the city. once exotic and very secure. The highlight is of course the 7 km long beach, except in the monsoon period (between June and September) where strong currents make swimming dangerous. Along the beach, there are many stalls for dinner or lunch, but also clubs offering evening concerts outdoors, and multiple aquatic activities are offered at very low prices. You can also take yoga classes, and if you stray a little bit from the city, to the northeast, you will discover an observation area dedicated to local wildlife and in particular to migratory birds. To visit also: the Saint-Alex Franciscan Church, one of the oldest in the region, with its towers and dome, and its golden and white rococo style; Fort Aguada, from 1612, remains of the Portuguese occupation, and its lighthouse of 13 meters which will allow you a beautiful sight on the area; the Beaux-Arts Gallery and its renewed exhibitions of regional artists in the field of photography, painting, sculpture, but also its classical music concerts; Kerkar Gallery dedicated to the work of Subodh Kerkar and other international artists. You can reach Calangute in half an hour by bus from Panaji.